Emotions are rough and fluid things—sudden, sometimes extreme, universal and impermanent. While all of us express emotion when we feel it, and can occasionally fake it, too, it takes a gifted artist to observe, explore, then reproduce the full breadth of human emotion. Silent film actors, blessed with long shot-lengths and the need for pantomime, did it better than anyone. The best of them could present a symphony’s range of feelings with exquisite precision. Nevertheless, the simplest word is more precise than the most talented face. Speech both describes and defines. And in cases where our interpretation of a character’s thoughts may be in doubt, speech often reduces our options. Rhett Butler, for example, is anything but ambiguous when he delivers his famous goodbye to Scarlett O’Hara. We get the message. Only Scarlett, with her gigantic ego, could still think he gives a damn. But is such certainty really so valuable? While I’m not suggesting Gone With The Wind would have been better silent, I do wonder how silent actors might have tackled that final moment between two people with such a long and painful history. Silent films remind us that moments are pregnant with possibility, just as a look can have many meanings. Anything, and indeed, everything, can come to the fore. How did Elena end up like this? We don’t know. Likewise, we’re unsure what Elena is feeling now. List the emotions on Garbo’s face: shyness, shame, uncertainty, scorn, amusement, devotion... is one real and the others, simply put-ons? Is she even sane? I love the ambiguity. It pulls me in. Perhaps this lack of clarity is part of why silent films hold such charm for me. In an era when I can control the volume, aspect ratio, contrast and soundtrack of any DVD I watch, and perhaps select alternate endings or even hear the director’s thoughts on the day of a shoot, it seems like I have total control over what I watch. But I will never, ever be sure what Greta was thinking that day in Paris. The mystery begins there. Chris: Your post really blew me away! What really drew me in to silent films was how than can convey such intense emotions, and how much the viewer gets involved when speech is removed. 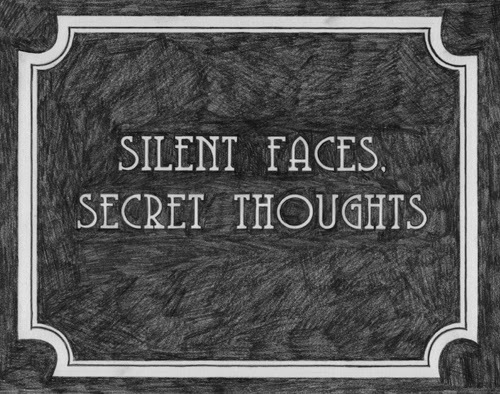 You really captured what make silents so great! Thanks Elizabeth. I'm especially glad to get the Lillian Gish clip out there. No one's heard of that movie, but I find it fascinating. And weird. And I concure on the title card, Kate. Much obliged. Thank you so much for doing the post, Chris! I understand exactly what you mean -- and you have me wanting to watch silents a lot more often now!! Thank you so much for sharing those clips. I've only recently been getting into silent films and I love their intensity. After reading this post I definitely want to see more of Clara Bow and I absolutely loved the Mary Pickford clip. I'm really wanting to see the whole film now.